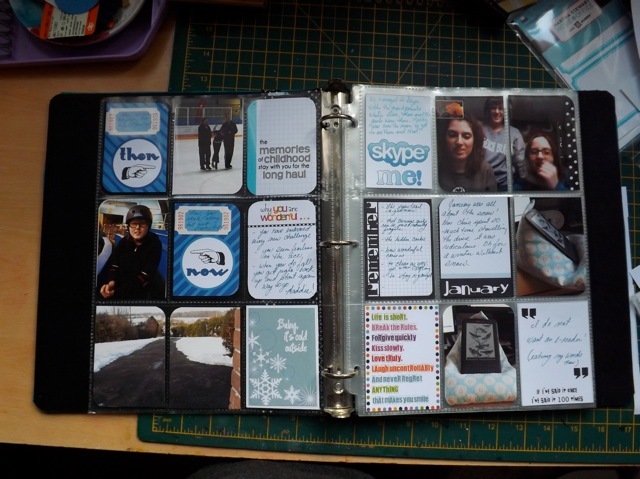 I have finished my first spread for my strange little 2.5 x 3.5 sleeve PL album. I think the whole thing is going to take me some time to come to grips with. At least it has done what I intended, which it to get me to actually take some photos of daily life things and get them into an album of some sort. Most of the printables are either ones I have made and shared already or are ones I made specifically for this (like the THEN and NOW ones – which I think I will make as a set this week in the standard 3 x 4 size. I’ve documented DDs skating progress, the excessive snow, my possible change-of-heart over e-readers, as well as by fab Christmas gift from DD. and a Skype screen capture from a conversation we had with my very dear sister and her girls. I’m happy with the moments I captured but not overly happy with the layout. It sort of came into being as I worked on it – I think I may want to plan better for future months, both in placement and colour combos. Some of the charm of PL is the random nature of it, I think, or at least for me, but I will either need to let go of the whole things should “match” idea or pre-plan better. Not sure which way it will go the be honest. And just to add a little group of printables. Bright and vibrant, most with a journaling block (just didn’t like the block on the blue circles so I left it off) – hope they will be useful. Categories: printables, Project Life, scrap related | Tags: printables, Project Life, scrapbooking | Permalink.